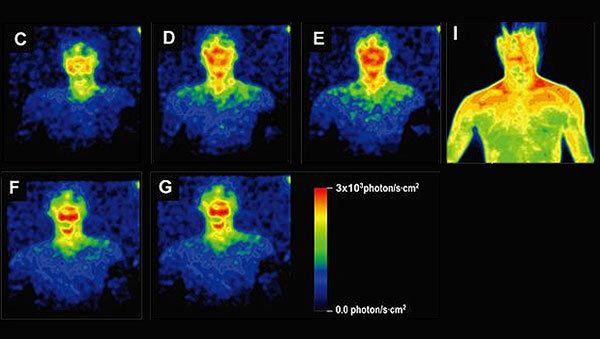 Human Bodies Glow with Their Own Bioluminescence! Home Web Human Bodies Glow with Their Own Bioluminescence! It’s not just fireflies and those bizarre deep-sea fish that dangle lights in front of their jaws to attract unsuspecting prey that glow. Human beings also have bioluminescence, it seems, according to research from Kyoto. The human body emits tiny amounts of visible light throughout the day, but the levels of light fluctuate according to the time. We’ll still need torches to pick our way through the dark woods, though, as the light we emit is 1,000 times less visible than the minimum we can register. There’s nothing supernatural about this phenomenon, it’s not one of those “auras” that hippies talk about, or anything else spiritual; it’s common to all living creatures. This light, it’s believed, is a by-product of the trillions of chemical reactions going on in the body, day in, day out. These reactions involve electrons jumping around between energy levels, losing energy in the form of photons as they do so. You might be thinking that it’s dependent on temperature, but you’ll be confusing this light with infra-red light, which is invisible and comes from our body heat. Researchers at Kyoto University in Japan used incredibly sensitive cameras, similar to the ones developed and produced by UK company Andor, to detect the miniscule amounts of light. The cameras were sensitive enough to detect single photons, and these photons emanated from the bodies of five very patient male volunteers. The volunteers, all healthy males in their twenties, were asked to sit still, bare-chested, in front of the cameras for 20-minute stretches, three times a day, between 10.00am and 10.00pm, for three days. Interestingly, it seems that the bioluminescence could be a key to understanding our biorhythms and metabolism. The researchers discovered that our bodies’ light rises and falls over the course of a day. The lowest point is at around 10.00am, rising to a peak at 4.00pm, before dropping slowly over the rest of the day. It’s almost certain that this fluctuation is because our metabolism peaks and troughs, with more light being produced when our cells are working at their hardest. The faces of the volunteers emitted more light than other parts of their bodies. It’s thought that this is because our faces are exposed to more sunlight than most other body parts, so they get more tanned. Melanin, which gives our skin varying shades of colour, has a few fluorescent compounds that may help to enhance the tiny amounts of light. As the light, faint as it is, is inextricably linked to metabolism, it can most likely be used to detect various medical conditions. Some conditions cause areas of higher-than normal metabolism, while others depress it somewhat. At the very least, we will gain more of an understanding of our circadian rhythms and how to work more with them, or how to adapt them. Night-shift workers, for example, could benefit from future technology or medications that shift their body clocks so that they synch with their work schedules. Unlike the light, the applications of this knowledge remain to be seen.